Sandy Perez, manager of the NorthBay Adult Day Center (left) and regular Day Center visitor Misako Woolsey show off the recent renovations made to the center’s outside activity area. The NorthBay Adult Day Center in Vacaville is enjoying a renovated outdoor activity area, thanks to a bequeath to the center made by Oretta Cortland, a long-time NorthBay Guild member who passed away in 2009. The renovations include an enclosed patio area and a sunscreen. Cortland had taken out a $20,000 life insurance policy and named NorthBay Healthcare Foundation and the NorthBay Alzheimer’s Program as beneficiaries. The NorthBay Healthcare Foundation then established a permanent endowment fund with $10,000. “The Oretta Cortland Endowment will provide funds to help NorthBay Alzheimer’s services in perpetuity,” says Brett Johnson, Foundation president. The balance of the donation was then allocated to the NorthBay Adult Day Center. Part of the funds was used to renovate the patio area, and the renovations have been very well received by program participants, Perez says. The Oretta Cortland Endowment will provide funds to help NorthBay Alzheimer’s services in perpetuity. Perez has also reserved some funds from Oretta’s bequeath to provide scholarships for her financially strapped families, which means clients and their families will continue to reap the benefits of Oretta’s generosity for many years to come. The NorthBay Adult Day Center, which is open five days a week from 7 a.m. to 7 p.m., is the only program of its kind in northern Solano County. 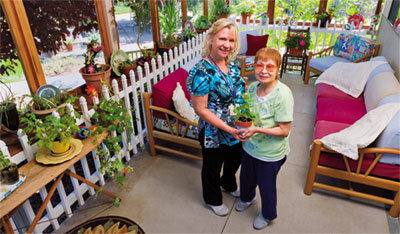 For more information about the NorthBay Adult Day Center, call (707) 624-7970. For more information about how you can leave a legacy of your own through charitable planned giving, contact Brett Johnson, president of the NorthBay Healthcare Foundation at (707) 646-3130.